Find My Workspace lists over 95% of the serviced offices & coworking space market in Hung Hom. Simply click Request Quote to check pricing for one office, or Add to Basket for multiple offices. This centre offers private office solutions and is ideal for start-ups and SMEs. To cater to the needs of users, the space provides private studios and multi-purpose event spaces. A variety of services and equipment suitable for organizing workshops, training courses and seminars are also on offer. There are inspirational quotes and paintings that line the walls. A combination of wood, glass and quirky lighting is used to create a distinguished working environment. 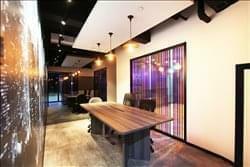 The office space in Hung Hom offers co-working space and serviced offices and can cater to your office needs. 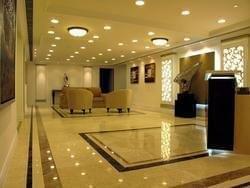 Secretary services are available while it also has a pantry with food and drinks that are complimentary. 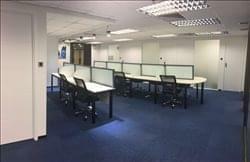 Fixed and hot desks, locker services, mail services can be used by tenants while to ensure safety and security, there is CCTV to monitor the building. Staff are very friendly and easy to work around. 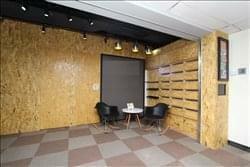 Overall, the space is definitely welcoming and comes with the added bonus of 24 hour access. Ideal for start-ups and small companies, this centre provides a business address with mailing and parcel facilities, 24-hour security systems, air conditioning, a pantry and regular cleaning services. Each member has access to printing and copying facilities, independent phone lines and stable high speed networking. A neutral space with a combination of carpeted and wooden floors, white walls and timber feature walls enabling you a semi blank canvas to decorate your office space. This centre provides serviced offices at highly competitive rates, offering a classy and cosy working environment, complete business facilities and professional office support services in order to save you time and money. The terms are flexible according to your needs. No matter if it is a temporary 1-week use or a full year term. This centre also provides various forms of office spaces to cater different sizes of SMEs. There are single rooms for 1–3 people and centralized office for 1–14 people. At the same time, there is a hall-style meeting room which can accommodate 18–25 people. It can be rented hourly or daily. To obtain information for your selected Hung Hom Serviced Offices & Coworking Space, please tick the "Add to basket" box for each office you prefer and complete the form below. We will then send a detailed report via email.